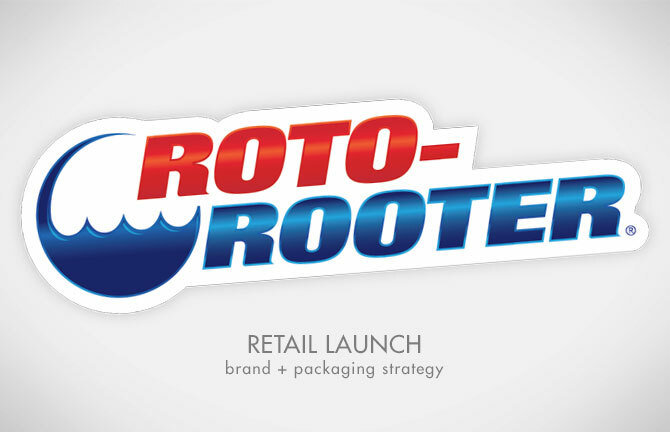 Array is excited to see one of our design projects finally hitting store shelves — Roto-Rooter DIY Plumbing Products. Roto-Rooter was looking to launch a line of drain cleaners and septic treatments into retail but desired an update for the Roto-Rooter logo and outdated packaging. Array jumped to the task of developing a creative solution that didn’t detract from the established professional feel. The goal was to refresh and reposition Roto-Rooter while maintaining current brand equity. The end result was a brand statement that is modern, vibrant and energized. The Array team created a consistent look across all deliverables, including the packaging, retail merchandising, sales materials and brand guidelines. To see examples of the full project, check out our portfolio page HERE. With over 75 years of professional plumbing heritage, Roto-Rooter high-performance drain care products are guaranteed and proven safe to destroy the toughest clogs fast. And if the product doesn’t perform, a real Roto-Rooter technician will aid in solving the problem. Read more about the in-store launch HERE. Ultimately, consumer testing was completed ensuring Array had all the information needed to present a finely-tuned messaging strategy. Great work team!